1st May sees a change in regulations on the Eucmbene and Thredbo. You may only take 1 trout per day over 50cm in these rivers, from this date, till they close completely at the end of the June long weekend. The Eucmbene River upstream of the flying fox and all tributaries of the Eucumbene River are totally closed during this period. The Thredbo has still been fishing well on dries. Reports suggest that the middle of the day has been the best time to fish. 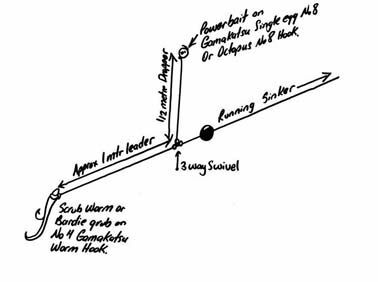 With cool nights the warmer times of the day are more likely to produce hatches and therefore a better chance at finding feeding fish. There were reports of good fish taken on dries this week. Make the most of the good conditions while you can before the rivers close. If we do get some rain and the weather turns cold a nymph under an indicator will work well. Best flies were stimulators, adams, royal wullfs, humpy's and klinkhammers. Lake Eucumbene:- Not many reports form Eucumbene this week. Some local Anglers have been getting a few nice rainbows in the Yens Bay area. But you do have to work for them. The river mouth is well worth a look if we get some wet conditions. Best areas for shore based anglers have been Middlingank, Rushy Plains, Yens Bay, and Braemar. Try woolly buggers craigs nightimes or other large wets during the evening or early mornings. Jindabyne:- With the lake now starting to drop slowly there are some large weed beds around the edges. There have been several reports of good fishing after dark with wet flies. Try the western side of the lake and fish through the night. Best patterns to use have been fuzzy wuzzys, craigs nightimes, baby dolls, and woolly buggers. Eucumbene:- There has been some excellent trolling this week. Still plenty of 800gram average rainbows being caught along with the occasional brown. Leadcore and down riggers have been used for the majority of better catches reported this week. Tassies and Cobras #36, Y48, Y05, and 55. Flatfish and Kwikfish in perch scale and Crickhoppers in all colours are working well. Richard Giles from Brisbane reported catching 35 fish in 6 days fishing in the Old Adaminaby area. Best fish weighed 1.6kg. Three colours of leadcore with Tassie Devils in # 36, Y48, and brown Crickhoppers were the main fish takers. These were fished off very long leaders. Jindabyne:- Reports from Jinde have been light this week, however good numbers of fish have started to show up in the Creel Bay/Waste Point area. Large minnow style lures fished off a downrigger will put you in the running for a large brown in this area at this time of year. Again fishing lures deep has been the most successful from those that did give reports. The ever reliable Power Bait is continuing to catch fish at present. The best rig for this is using scrubbies with a Power bait dropper (pictured below). This rig has really proven itself over the last few seasons; with both options you really have it covered.Power bait naturally floats, so the distance you make your dropper is the distance you can expect your Power bait to be above the bottom. This means that fish will find your bait a lot quicker even if you have cast into weeds. If they don't eat the Power bait they have found your main bait a lot quicker. Best colours in the Power bait have been Orange, Sherbet, Lime twist , lemon twist and rainbow. The hook is important when fishing with Power bait and we get a special "single egg" pattern in from Gamakatsu just for the job - which has a short shank and ultra wide gape. Feel free to ask us to go over the rig next time your in if still unsure. Best areas on Eucumbene include: Middling bank, Frying pan, Seven Gates, Yens bay, Breamar bay and along the dam wall.